Dr. Carol Vavra's experience stems from working in many different types of clinics, ranging from emergency clinics, to full service clinics, to out-patient clinics. She began learning holistic veterinary care after becoming increasingly frustrated at seeing the same problems over and over again in our pets such as arthritis, back (disc) abnormalities, and others. Medications and surgery could only help to a certain degree. That was when she began learning about acupuncture and how it was used for pain relief. Shortly after that she began the Veterinary Acupuncture Certification program offered by the Chi Institute of Traditional Chinese Medicine in central Florida. The concept of treating the WHOLE animal, not just the particular ailment, is the most important aspect of the treatment and this is what acupuncture and Chinese herbal formulations do. This is such a basic concept but is forgotten in many practices and also lost in human medicine. 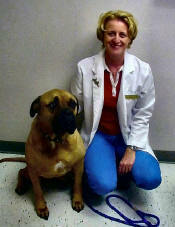 Below Dr. Vavra gives us a better understanding of holistic care for our beloved companions. QuickTime Video Plug-InBullmastiffInfo.org: Please explain what holistic medicine is. Dr. Vavra: Holistic medicine to me means using ALL aspects of medicine to help prevent, diagnose, or treat disease. This must include conventional western medicine as well as alternative modalities such as supplements, herbals (both western and Chinese), homeopathy, etc. BullmastiffInfo.org: In your practice you incorporate the knowledge of both Western and Eastern philosophies. How does help you help your clients? Dr. Vavra: The more we can offer the client, the greater the chance we can help their pets. It is essential to establish the correct diagnosis and western medicine is always needed before the correct treatments can begin. It is so important for our pets to undergo all appropriate diagnostics including bloodwork, x-rays, ultrasound, biopsies, and other tests as determined by the veterinarian. We can then look at all the treatment options, and many times a combination of western and Chinese medicine is the best way to go. 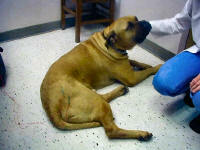 BullmastiffInfo.org: Please explain what practices are involved with holistic veterinary medicine. Dr. Vavra: I prefer to cal it Complementary Medicine because these modalities are used in conjunction with conventional medicine. They include acupuncture, homeopathy, chiropractic therapies, herbal therapy (both western and eastern), supplements, nutrition, orthomolecular therapy, magnetic therapy and others. BullmastiffInfo.org: What is acupuncture? Are there different methods of acupuncture? Dr. Vavra: Acupuncture is the process of stimulating certain points along meridians in the body to create a physiologic response that helps treat and prevent disease. Many different techniques can be used when using Traditional Chinese Medicine (TCM) to diagnose and treat our pets. Variations include the number of points selected, length of the treatment time, method of point stimulation, and types of points used. QuickTime Video Plug-InBullmastiffInfo.org: Please explain what �meridians� are. Dr. Vavra: Meridians are energy channels in the body - most acupuncture points are located on meridians. These meridians �connect� the internal organs to the acupuncture points. BullmastiffInfo.org: Do these �meridians� differ from species to species? Dr. Vavra: Not dramatically when we are talking about mammals. Dogs, cats, and horses have the same meridians humans do. More studies are required on birds, but many points have been used with various degrees of success. BullmastiffInfo.org: What about in different breeds within the same species? Dr. Vavra: The meridians would be in the same anatomical positions in the different breeds. BullmastiffInfo.org: How does herbal treatment work? Dr. Vavra: Chinese herbals work using TCM principals, and not the western medicine diagnosis. I may see 3 different animals with hip dysplasia, and each would require a different Chinese herbal formulation based on the TCM diagnosis. These TCM principals include Yin/Yang imbalances, hot or cold conditions, wind or damp conditions, and many others, most of which do not have a western medicine definition. This is why we ask MANY questions about the pet�s habits, preferences, and daily behavior, and want to know about the environment they live in. BullmastiffInfo.org: Are these herbs easily accessible over the counter? Or should the herbals that are used be specifically made for animals? Dr. Vavra: There are many sources of Chinese herbals out there. Reputable companies should only sell herbals to professionals who have a knowledge of herbals and how to prescribe them. Along those same lines, anyone who buys herbals (veterinarians, other professionals) wants to be confident that there is quality control within the company and we are getting what we order. The majority of herbals are formulated for humans � I know of only one company that formulates herbals specifically for dogs, cats, and horses. Both work equally well and are prescribed in the same manner. BullmastiffInfo.org: What conditions are most receptive to acupuncture and herbal treatment? Dr. Vavra: Painful conditions such as arthritis and back problems usually respond well. I also find geriatric animals respond well to basic geriatric support. They get more energy and owners find they participate in daily activities more. Animals who have paralysis or weakness in the limbs can also be helped. Many more conditions can be treated, conditions which wouldn�t immediately come to mind. Animals with chronic conditions such as kidney and liver disease and animals with cancer can also benefit from acupuncture and herbals. I encourage anyone with a pet who is battling a problem to find a veterinarian who is familiar with alternative therapies and ask what more can be done. They will be surprised. BullmastiffInfo.org: How soon would a client see results as a result of holistic care? Dr. Vavra: Most of these therapies work to bring the body back into balance so results can take time. In many animals we see an initial response to the first 1-2 acupuncture treatments, and they will continue to improve with more treatments. Some may take 7-8 treatments to see a response. A few animals will not respond at all. BullmastiffInfo.org: Would the client have to continue the same treatment for the duration of their life to continue good health or would they be �cured� of the actual ailment after a set number of treatments? Under what circumstances? Dr. Vavra: This depends. Animals with chronic conditions (arthritis, cancer, disc problems, kidney disease, etc) will need ongoing treatment, but the goal is to eventually space these out so we may only see them every few weeks to months. Animals with acute conditions (bacterial infections, diarrhea, soft tissue injuries) may only need a few treatments. And, of course, each animal responds differently. BullmastiffInfo.org: Acupuncture and herbal care is also conducted on humans, would you be able to perform acupuncture and herbal care on humans as well? Why or why not? Dr. Vavra: This is not only unwise, but illegal. And this holds true for human acupuncturists treating animals. We as veterinarians are not trained in human medicine and, even though much of the physiology and disease processes are the same, should not attempt to practice medicine on a human. In the past many human acupuncturists would do acupuncture on animals, mainly because veterinary acupuncturists did not exist. This should never be encouraged for many reasons, the main one being that the proper diagnosis was usually never made. 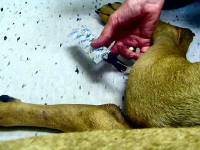 Now that there are many veterinary acupuncturists out there, this should not be a problem. BullmastiffInfo.org: Many families are still hesitant to try holistic care for their beloved companion. What advice can you give to these families to become more comfortable with the merge between holistic and conventional veterinary care? Dr. Vavra: The first and most important point is that it MUST be a merge of all modalities. A client should never be told that �this way� is the only way to treat their animal, whether it be conventional medicine, or acupuncture, or chiropractic care, or homeopathy� If any practitioner says this they should go for a second opinion, or third opinion. Secondly, I think many people are put off by the term �holistic�. They believe if they see a holistic veterinarian they will be told that all conventional medicine is bad and they should stop all medications, vaccines, and other therapies. This is not true. The best practitioner will use a combination of therapies to help the pet, and the veterinarians should work together to formulate the best treatment. And last, they should ask themselves if they are happy with the results of the specific treatment their pet is receiving. What about side effects? Are the painkillers still working? Has the cancer returned? If the current treatment, whatever it is, is no longer working for their pet, they should ask their veterinarian to help them find someone who can answer their questions about alternative therapies. BullmastiffInfo.org: Are there any books and/or articles that you recommend for pet owners that would like to become more acquainted with holistic practices for their pets? Dr. Vavra: My favorite book for clients about Chinese Medicine is Four Paws Five Directions :by Cheryl Schwartz DVM. This discusses Traditional Chinese Medicine theory and how it is applied using acupressure, herbals, and food. 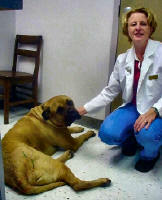 I also like Natural Healing for Dogs and Cats A-Z, also by Cheryl Schwartz DVM. Two other books that discuss acupressure are Acu-Cat, A Guide to Feline Acupressure, and The Well Connected Dog, A Guide To Canine Acupressure, both by Amy Snow and Nancy Zidonis. There are many books out there about treating animals in a more natural way and it is important that clients discuss any treatments with their veterinarian or a veterinarian who is interested in holistic therapies. BullmastiffInfo.org: Credentials are always important when looking for a qualified holistic practitioner, what should a client look for when searching for a holistic veterinarian for their companion? Dr. Vavra: Many modalities now have certification courses. Veterinarians who practice acupuncture, chiropractic care, and homeopathy can and should be certified. BullmastiffInfo.org: Holistic medicine is slowly becoming more acceptable by veterinarian clinics that primarily practice Western medicine and techniques. For those clinics that have not yet opened their doors to holistic care, what advice do you have for them to become more comfortable with this Eastern concept? Dr. Vavra: Many veterinarians will refer their patients for alternative therapies as a last resort, when no other treatments are working. Some will never refer for alternative therapies. I believe in both these cases the veterinarians are not aware of exactly what conditions can be treated with alternative therapies, or they feel if western medicine is not helping, nothing can. Education is the key here. Becoming more familiar with alternative therapies will help all veterinarians talk about these with their clients and offer more treatment options early in the course of a disease. Also, more and more clients are seeking treatments other than medications, chemotherapy, or surgeries, or want to minimize these if they can. They should trust their veterinarian to give them the most recent information or be able to refer them to someone who can. BullmastiffInfo.org: What is the best way to contact you for an appointment and/or consultation? Dr. Vavra: I can be contacted at cvavradvm@yahoo.com. I will only be able to answer general questions about Traditional Chinese Medicine and other alternative therapies without actually seeing an animal. Dr. Vavra: Traditional Chinese Medicine and other complementary therapies are gaining acceptance and popularity in the United States, but have been practiced in other areas of the world for hundreds and even thousands of years. I truly believe that it is our responsibility as pet owners and veterinarians to research and offer the best possible care for our loved ones, whether two- or four-legged.